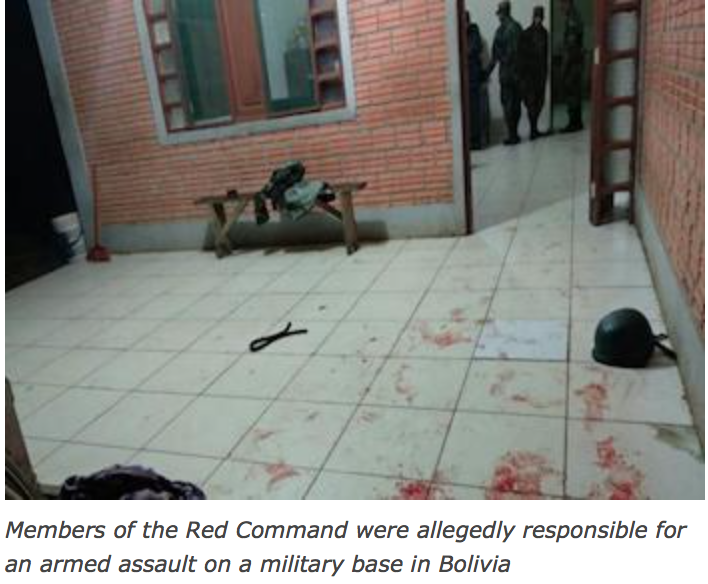 Red Command Arrests in Bolivia Point to Group’s Likely Expansion … evo fails Bolivia big time! Police in Bolivia have captured three alleged members of one of Brazil’s most powerful criminal groups after a brazen armed assault on a military base, raising urgent questions about why the Brazilian mafia is amassing arms in the border region. The arrests took place after the Bolivian government flooded the border region around the town of Porvenir with troops and police in response to the attack of June 16, which intelligence agencies blamed on the Brazilian organized crime network the Red Command (Comando Vermelho), reported La Razon. The raid saw at least seven armed men on motorcycles, believed to be a mixed force of Brazilians and Bolivians, wound two soldiers as they stole nine rifles, five pistols, 11 magazines and 1,200 rounds of ammunition. The assault was the second arms heist allegedly committed by the Red Command in the border region in the space of a week. Just days before, attackers made off with up to 30 rifles and 2,000 rounds of ammunition from a Brazilian police base in the nearby municipality of Epitaciolandia. Bolivia’s Minister of Government Carlos Romero warned the attacks could herald more violence. However, the police commander of the border department of Pando, Coronel Marco Antonio Cortez Castedo, played down the presence of the Red Command in Bolivia. Despite the continuing protests of Bolivian officials such as the local police commander, the assault in Porvenir is just the latest evidence of the advance of Brazilian mafia networks in Bolivia. The Bolivian coca base market is likely the main attraction for the Red Command as their home country represents the world’s largest market for the drug. Furthermore, while Colombian networks often control cocaine processing laboratories and trafficking routes, the Brazilians can deal directly with local producers to secure base. What remains to be seen is whether Brazil’s criminal conflicts will also migrate across the border as its competing criminal groups seek control of this trade. Last year, Bolivian officials talked of an agreement between Brazil’s most powerful criminal networks to divide up territories in Bolivia, with the Red Command controlling the region of Pando, where Porvenir is located, and the First Capital Command (Primeiro Comando da Capital – PCC) staking a claim to Santa Cruz. However, more recent reports warn of possible new conflicts developing in Brazil, which could threaten the stability of any agreement in Bolivia. And the Red Command’s aggressive sourcing of arms in the border region should sound alarms that at least one actor in this conflict could now be preparing for violence.